Gasoline prices are falling -- where is the tipping point for car sales? DETROIT -- The stock markets, before today's 287-point Dow Jones rally, have fallen for the last month and gasoline prices have followed suit, but have prices dropped enough to change how consumers and dealers buy vehicles? Gasoline prices typically influence many car-buying decisions, but the tipping point for when buyers change those decisions is a moving target. The national average for regular unleaded is $3.56 per gallon today, down 37 cents from their 2012 peak of $3.93 on April 6, according to AAA. Dennis Virag, president of Automotive Consulting Group in Ann Arbor, Mich., said dealers will likely stock more SUVs and pickup trucks when gas prices fall. The mix in vehicles sold changes with gasoline prices, Virag said. Ford sales analyst Erich Merkle said dealer demand comes down to consumer needs. “You look at pull. What are customers looking for?” Merkle said. In May, they weren’t looking for fuel efficiency as much as they did the previous two months. 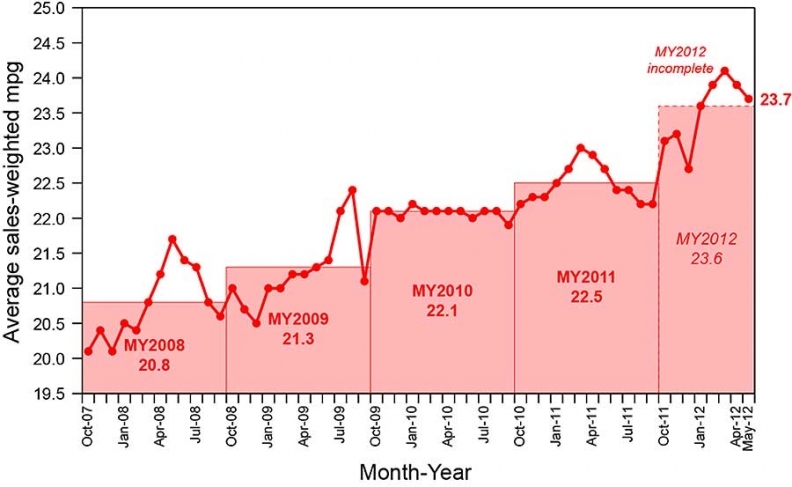 The average fuel economy of cars and light trucks purchased last month in the United States was 23.7 mpg -- down from 23.9 in April and 24.1 in March -- but still the fourth-highest average mpg for a month on record and up 3.6 mpg (18 percent) from October 2007, according to data compiled by University of Michigan Transportation Research Institute researchers Michael Sivak and Brandon Schoettle. The figures were tabulated from monthly sales of light-duty vehicles and combined city/highway ratings gathered from the EPA Fuel Economy Guide. Schoettle, a research associate for the institute, said when there’s a noticeable decrease in gasoline prices and the unemployment rate, consumers may be more likely to purchase larger models. Despite the current trend, both Virag and David Champion, senior director of the Consumer Reports Automotive Test Center, agree that fuel economy will still play a major role going forward. Champion said he expects those with massive SUVs like the Chevrolet Suburban to “migrate” to smaller options such as the Chevrolet Traverse and the Ford Explorer. Merkle said people in the long run are moving back to smaller cars. Patrick DeHaan, senior petroleum analyst at GasBuddy.com, said the health of the U.S. economy has played a role in the decline of gasoline prices. The unemployment rate ticked up to 8.2 percent in May from 8.1 percent in April after only 69,000 jobs were added, according to the U.S. Labor Department. With slowing job growth, DeHaan said there are concerns of how healthy the economy really is. “If there are fewer people working, there will be less people with disposable income” and “less people driving to work,” he said. The European debt crisis, he said, also has put “downward pressure” on prices. Crude prices, which are the “biggest driver of gas prices on any given day,” fell 15 percent in May, according to Michael Green, spokesperson for AAA. ANN ARBOR, Mich. -- For the second straight month, fuel economy of all new vehicles sold in the U.S. fell by 0.2 mpg—likely reflecting a slight drop in gas prices, say researchers at the University of Michigan Transportation Research Institute. Average fuel economy (window-sticker values) of cars, light trucks, minivans and SUVs purchased in May was 23.7 mpg—down from 23.9 in April and 24.1 in March—but still the fourth-best month on record and up 3.6 mpg (18 percent) from October 2007, the first month of monitoring by UMTRI researchers Michael Sivak and Brandon Schoettle. During March, the EDI stood at 0.83, worse than the 0.81 mark in February, but the same as in January (the lower the value, the better). The index currently shows that emissions of greenhouse gases per driver of newly purchased vehicles are down 17 percent, overall, since October 2007. Finally, Sivak and Schoettle report the unadjusted Corporate Average Fuel Economy performance. This index is based on a different set of EPA ratings than window-sticker values. For May, unadjusted CAFE performance was 29.1 mpg, down from 29.3 in April and 29.6 mpg in March, but an increase of 18 percent (4.4 mpg) since October 2007.